South Korean high school shortstop Bae Ji-hwan has signed with the Atlanta Braves. The National League club announced its signing of the 18-year-old on its Twitter page Saturday (local time). Financial terms of the deal were not immediately disclosed. 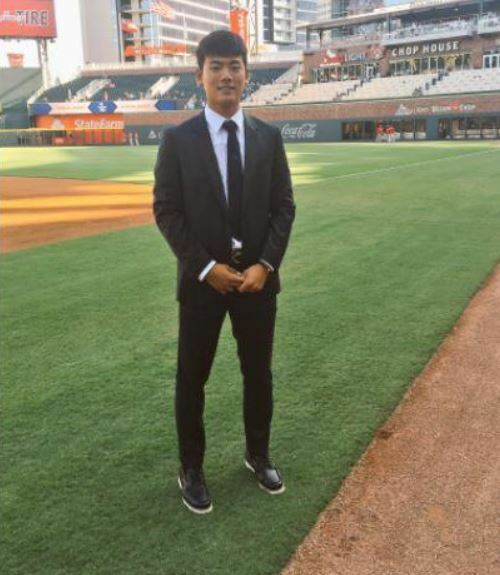 The Braves also uploaded a photo of Bae standing on the field at SunTrust Park, their home stadium, in a suit. In another picture, Bae poses with fellow South Korean and Philadelphia Phillies outfielder Kim Hyun-soo, whose club is visiting Atlanta. A product of Kyeongbuk High School in Daegu, some 300 kilometers southeast of Seoul, Bae was a member of the runner-up South Korean team at the World Baseball Softball Confederation U-18 Baseball World Cup in Thunder Bay, Canada, earlier this month. He played in all nine games for South Korea, batting .286 (8-for-28) with five RBIs, six runs scored, six walks and two steals. At all national competitions this year, Bae has batted .465 (40-for-86) with a home run, 17 RBIs and 29 steals. Bae had been one of the most coveted prospects to come out of high school this year. He skipped the annual draft for the Korea Baseball Organization, the top domestic competition, where he would have been a top-five pick. Bae is an increasingly rare breed of South Korean players in that he has bypassed pro ball at home to sign with a big league club right away. He is the first to go from a Korean high school to the United States since outfielder Kwon Kwang-min, who signed a US$1.2 million deal with the Chicago Cubs in August 2015 out of Seoul's Jangchung High School. In recent years, it's been mostly KBO professionals moving to the majors, either via posting or free agency.